Q: Does Oklahoma still execute more people per capita than the rest of the nation? A: Oklahoma remains a state that is more inclined to impose the death penalty than almost all other states. 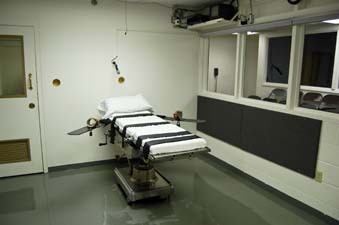 According to the nonprofit Death Penalty Information Center, which tracks executions, Oklahoma had the highest per capita rate of executions from 1976 through mid-2011, with 0.288 executions per 10,000 population. The state put 111 criminals to death. Texas had the second highest rate and the largest number, executing 515. Richard Dieter, executive director of the death-penalty center, said the center hasn’t updated its cumulative execution rates recently, but Oklahoma’s No. 1 ranking likely still stands. In 2013, Oklahoma executed six people, giving it the highest rate among the nine states that carried out executions. Oklahoma’s rate was 0.015 executions per 10,000 population. So far this year, two men have been executed in Oklahoma. Michael Lee Wilson, 38, was put to death Jan. 9 for being one of three men involved in the killing of Richard Yost, 30, at a Tulsa convenience store. Kenneth Eugene Hogan, 52, was executed Jan. 23 for stabbing Lisa Stanley, 21, to death in 1988. Is Oklahoma’s problem with teen pregnancy disappearing?